Rick Bakas has scheduled this Thursday September 1st as 2011 #CabernetDay, where all are encouraged to consume and tweet about one or more Cabernet Franc or Cabernet Sauvignon wines. After perusing the cellar, we will open our last bottle of the Frederick Cellars 2001 Cabernet Sauvignon. This wine was crafted by Robert Lyons just before his Catoctin Vineyards was purchased by Frederick Cellars. Mr. Lyons has a long history of crafting award winning wines as his 1999 Cabernet Sauvignon joined the 2001 Cabernet Sauvignon as winners of the Maryland Governors Cup. The grapes for all their Cabernet is local, from Mountain Creek Vineyards in the Catoctin AVA. You can follow our feed on Thursday using the #CabernetDay and #mdwine hash tags. Cheers. One of the best kept secrets of the 2011 Wine Bloggers Conference was the Loudoun County Pre-Tour sponsored by Visit Loudoun. This two day tour was available to the first 25 bloggers who registered and consisted of visits to four wineries: Tarara Vineyard & Winery, Breaux Vineyards, Chrysalis Vineyards, and Boxwood Winery. Each winery rolled out the red carpet with the winemaker greeting the participants and providing tours and tastings of their regular offerings as well as reserve and barrel wines. These were very intimate engagements where the participants were able to discuss Norton or Albarino with Jenni McCloud and Alan Kinne at Chrysalis; Bordeaux with Rachel Martin and Adam McTaggart at Boxwood, Terroir with Jordan Harris at Tarara; and Nebbiolo with the Breaux crew. These wineries may be familiar to the larger group of conference attendees since they participated in many of the WBC11 events in Charlottesville, either as sponsors, the twitter tastings, the Other 46 tasting, and the Monticello dinner. Check out the video below, which includes audio from Stacey Sheetz of Visit Loudoun discussing the wine region, to see why this area is one of the top wine destinations in Virginia and considered DC's Wine Country. The video also features Tara Nevins (Donna the Buffalo) "Beauty of Days Gone By" from her new solo release: Wood & Stone . And below is a list of blog posts concerning the Loudoun pre-tour and WBC11. The last session of the 2011 Wine Bloggers Conference (July 22-24; Charlottesville, Virginia) was the Ignite Wine presentations where nine presenters had five minutes to talk about anything of interest to wine bloggers. The catch: each presenter had to show 20 slides auto-tuned to advance every 15 seconds. This was very entertaining; too bad not many attendees stayed around to witness. The 2011 North American Wine Bloggers Conference was held July 21-24 in Charlottesville Virginia. Here are the highlights from the various events, tours, seminars, and tastings during the weekend from the International Tasting Thursday night to the Ignite sessions Sunday morning. The video also includes footage from the vineyard tour of Virginia Wineworks, First Colony Winery, and Blenheim Vineyards. The musical theme features Tony Trischka performing at the Floydfest Front Porch courtesy of the Virginia Folklife Program. And one note, the Traminette shown in the International Tasting was from the Other 46 Tasting. Cheers. Another wine we found interesting during the WBC11 Speed Tasting was the 07 Chateau Mukhrani Saperavi - which resurrected our fascination with Georgian wines. For, the Republic of Georgia is the cradle of wine making, as evident by the 4,000 to even 8,000 year old wine making equipment unearthed by archaeologists in the country. We are talking Stone Age winos. Many etymologists even consider the modern generic word “wine” to be derived from the ancient Georgian word “gvino”. And what is equally fascinating is that contemporary wineries are using the same indigenous grapes as these early winemakers. We are talking Saperavi, Rkatsiteli, Mtsvani, Ojaleshi - wine grapes tasted by Jason and the Argonauts, Homer, Alexander the Great, Apollonius of Rhodes, St. Nino - thus when tasting Georgian wines - you're tasting history. And its no wonder that the Republic of Georgia is the birthplace of wine civilization. It's geography is well suited for grape viticulture. Extreme weather is rare; winters are frost free; summers are sunny; and the Black Sea provides a beneficial micro-climate. The largest grape producing region is Kakheti located in the eastern end of the country. This region produces 70% of the country's wine and, understandably, houses some of the largest wineries: Teliani Valley, Telavis Marani, Tbilvino, Kindzmarauli Marani, Badagoni and Chateau Mukhrani. Other noteworthy wine regions are Racha-Lechkhumi, Kartli, and Imereti. Racha-Lechkhumi is currently home to semi-sweet wines such as Khvanchkara, Usakhelouri and Tvishi. The Kartli region is also termed "The Heart of Georgia" because of its central location and the home of the ancient and modern capitals - Mtskheta and Tbilisi. Both Kartli and Imereti are known for their sparkling wines and the later also producing the red wines Oihanuri, Sapere and Saperavi. The country is home to over a dozen indigenous wine grapes. Rkatsiteli is the most important white variety and at one time was the third most planted varietal in the world. Mtsvani is the next most important white and is usually blended with Rkatsiteli. Saperavi is the most popular red variety and produces full bodied, somewhat tannic wines suitable for aging. Like the French, Georgian wines represent the name of the source region, district, or village. And many of these wines are blends, such as Tsinandali, which is a blend of Rkatsiteli and Mtsvane. Yet some 100% varietal wines are available -- including the aforementioned 07 Chateau Mukhrani Saperavi. And like most Eastern European wine styles, many of the red wines are produced semi sweet - even Saperavi. (No wine snobs permitted in the South Caucasus.) And fortified wines are very popular. Rkatsiteli seems to be my favorite of the Georgian grape varieties and at one time was the third most planted varietal in the world. Thanks to Dr. Konstantin Frank, Dennis Horton, and Jack and Charlie Tomasello, it has migrated to the United States and is now available at Dr. Konstantin Frank's Vinifera Wine Cellars, Horton Vineyards, and Tomasello Winery. The wines possess a recognizable spicy character that is balanced by citrus flavors and refreshing acidity. But what about the 07 Chateau Mukhrani Saperavi? I really can't recall - even after 2nd, 3rd, and 4th sips at #606. I did note, however, that the vineyards were once owned by a major Royal Dynasty - The Princes of Mukhrani. History and Georgian wine are intertwined. For further research visit any of the linked wineries or check out the Georgian Wine House. Georgian wines will remain in my mind for quite some time. 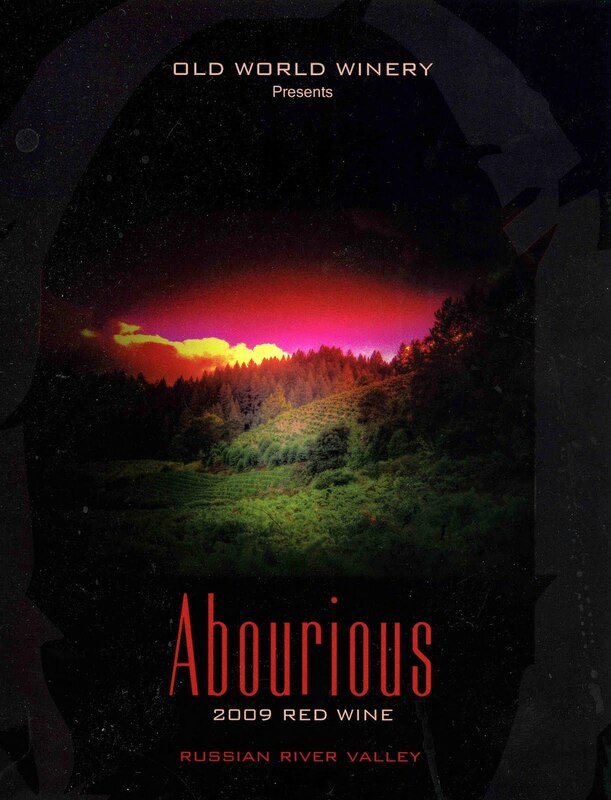 One of the more interesting wines poured during the Red Wine Speed Tasting during WBC11 was the Abourious 2009 Red Wine from Old World Winery (Russian River Valley, Sonoma County, California). Now, even with a room full of wine bloggers, most of us had never heard of - and obviously tasted - a wine made from the Abouriou grape. 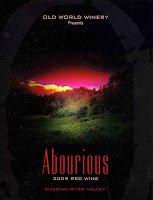 According to the esteemed Jancis Robinson The Oxford Companion to Wine, 3rd Edition , Abouriou is grown primarily in South West France, bordering Bordeaux to the north and the Pyrénées to the south. This region is includes the ACOs Jurançon, Cahors, Bergerac, and Côtes du Marmandais - home to Abouriou, where the grape is used in blends with Bordeaux varieties, Syrah, Fer, and Gamay. It is obviously also grown in California, with Old World Winery the only producer - at least as listed at WineCompass. Two acres of the grapes are grown organically at the Sheri Martinelli Ranch with these being harvested in October 2009 and bottled in June 2011. That's translates to approximately 18 months of aging. During the Twitter tasting, my colleague immediately designated the Abourious 2009 Red Wine as The Seducer - with its full body, high acidity; but sweet berry flavor profile. Other bloggers had similar comments as show below. But don't get too excited just yet about this wine. For #wbc11 was its unveiling; the release date is set for Spring 2012 with a $55 price point and only 109 cases available. Mark this on our calendar and visit the winery's online store. genevelyn: 09 Abourious REd, should be a martini float #wbc11 from us. enjoy! 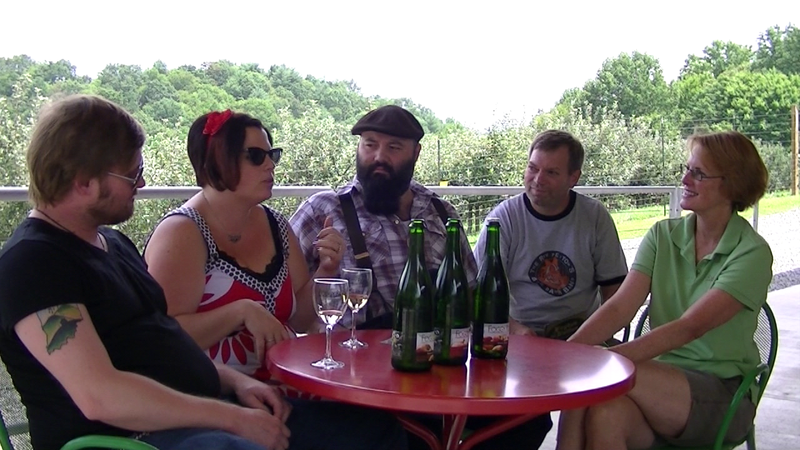 This episode of MyJoogTV features the Reverend Peyton's Big Damn Band in a discussion of cider, country blues, and Charley Patton with Foggy Ridge Cider proprietor Diane Flynt. The episode was filmed during Floydfest X, the celebrated music festival located right on the Blue Ridge Parkway and minutes from Foggy Ridge. Specifically, we discussed cider and apple varieties as well as the band's latest CD: Peyton on Patton. This is the first ever compilation to honor the man who is arguably the father of Delta Blues. In fact, most modern rock music follows a lineage from Patton through Muddy Waters and Howlin' Wolf to Elvis, the Beatles, and the Rolling Stones. To paraphrase the Reverend, "if it wasn't for Patton, we'd be listening to Tony Bennett - all the time". The video is available to download for iTunes and Windows Media Player. To view more videos filmed at Floydfest, visit the MyJoogTV YouTube Channel.